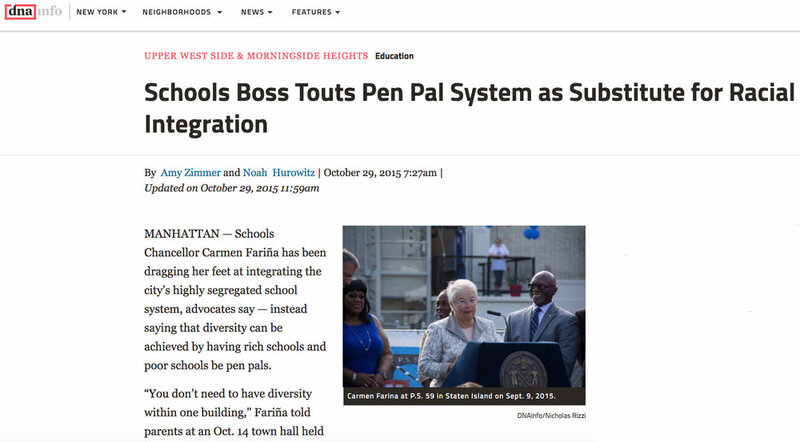 In her tenure thus far, Schools Chancellor Carmina Fariña has not accepted that concrete policy is necessary to address New York City's pervasive school segregation problem. In an October 14 town hall, she suggested that rather than implementing pro-diversity admissions policy to integrate students within a single building, segregated schools adopt pen pal or exchange programs with their "sister schools"
In fact, IntegrateNYC has directed such a program in the past -- and knows it is not a substitute for genuine integration. Check out Amy Zimmer and Noah Hurowitz's take on the issue, which includes details on IntegrateNYC4me's exchange and what we learned from it, on DNAinfo.